The other day as I was surfing YouTube for hairstyle ideas, I came across a popular beauty guru who was saying that applying onion juice to the scalp can help hair growth, especially if you have suffered from hair loss. I was obviously intrigued because it sounded pretty strange and kinda gross at the same time, since onions are so stinky! Who would want to put that on their scalp?! So of course, off to Google I went. As I was searching for the benefits of onion juice on hair growth, I stumbled across this study which shows onion juice can regrow hair loss from Alopecia (which is autoimmune). But the really interesting thing I found is that onion juice can actually REVERSE grey hair! 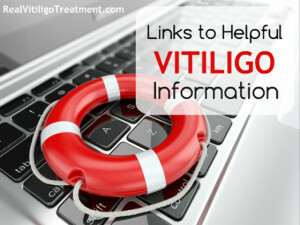 See, grey hair and vitiligo have something in common – they are both the result of oxidative stress. Oxidative stress is the result of a build-up of hydrogen peroxide, which is ultimately caused by a lack of catalase. Catalase is the antioxidant in the body that prevents oxidative stress, and grey hair. This is why Dr. Karen Schallreuter’s pseudocatalase works so well in repigmenting vitiligo. Off to Google I went again, this time searching grey hair+ onion juice, and then vitiligo+onion juice. I found this article on Natural News, which mentions that pseudocatalase, or P-KUS works for both grey hair and for the skin condition vitiligo. 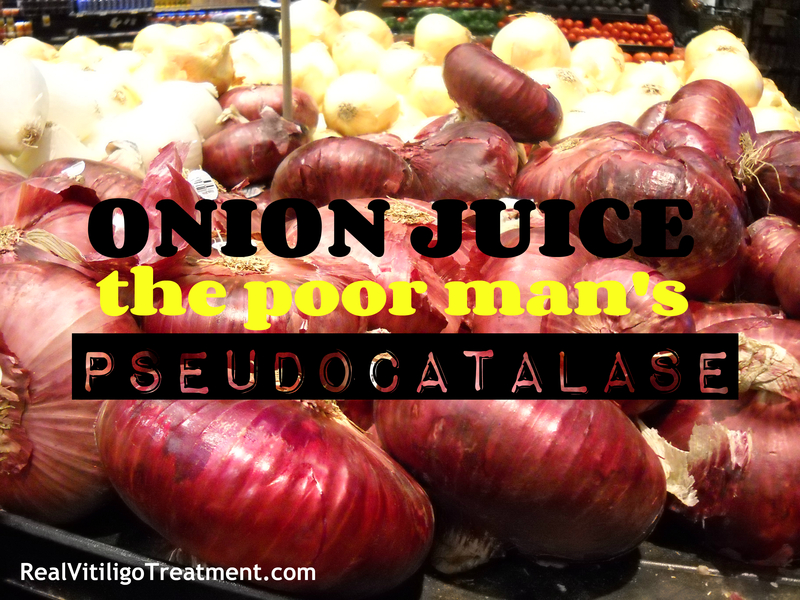 It turns out that onion juice promotes the production of catalase when applied topically to the skin. The reason that finding this is was so surprising to me is that just a few months ago, I had been trying to figure out an alternative to the pseudocatalase (P-KUS) from Dr. Schallreuter. The only way to get my hands on it, as far as I know, is to take a trip to Germany….and, well, that’s not an option for me. So could this really work? I don’t know, but I thought I’d share in case any of you want to give it a go! Very interesting, do you think garlic would have the same properties as onion (catalase)? My dad who passed away 2 years ago, applied garlic to his vitiligo before going out in the sun and did get rid of some of his vitiligo, so I guess garlic may possibly work in a similar way?! Can onion juice reverse grey beard too ? Can i apply and if yes how much time it vil take? Please need your help on this ! I am not sure if it can reverse a grey beard. If you were to try it, I would imagine it would take awhile to see some kind of result. has any one tried onion juice on scalp for grey hair ???? @ TJ have to any idea about that stuff?? Onion juice works for hair growth as well as on vitiligo. I have personally tried and got results. How do you apply the onion juice? And how often? 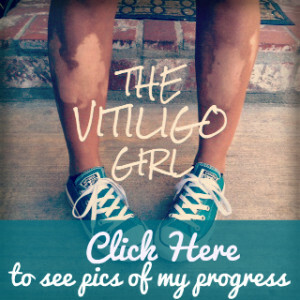 Have you tried onion juice on vitiligo yet? What are the results? I have not tried it yet, since I am doing so many other things right now! I still want to though, and I may give it a go in the summer months. Reverseing from grey to black by using onion juice?? It takes some time, but I’m not sure how long since I haven’t done it yet. I’m getting really good results using Wanakee Hill’s oil and Rapid Re-Pigmentation Cream combo and thirty minutes of sunlight per day. When I do this, I see freckling within a few days of sun exposure. What is the Rapid repigmentation cream, T.J.? Are you still using the Wanakee Hill’s oil and Cream? Did you ever try the onion juice?